The University of Delhi also known as Delhi University or DU is a premier institution in India for Undergraduate and Postgraduate Education. Established in 1922, DU has been continuously ranking as the top university in India. Home to some of the top colleges of the country, Delhi University has 70 odd colleges affiliated to it offering numerous courses. Five departments namely Chemistry, Geology, Zoology, Sociology, and History have the status of the Centres of Advanced Studies. These centers are known for the quality of education they provide and have carved a niche for themselves as centers of excellence in teaching and research in their respective areas. A large number of students apply at the time of Delhi University Admissions to get into these centers. Delhi University is famous for the Commerce, Arts and Science courses that it offers. The India Today Group along with Nielsen comes up with a list of the best DU colleges every year. Like every year, even this year they have come up with a list of top 10 Delhi University colleges for various streams like arts, commerce, and science. The list appears to be very surprising as many south campus colleges have been able to make it in the list this year. While Acharya Narendra Dev College & Deen Dayal Upadhyay College make their way to the top 10 DU colleges, Ramjas College has gone down the list. St. Stephen’s College is known for its high cutoffs. It follows its own admission procedure. Applications are completely online. 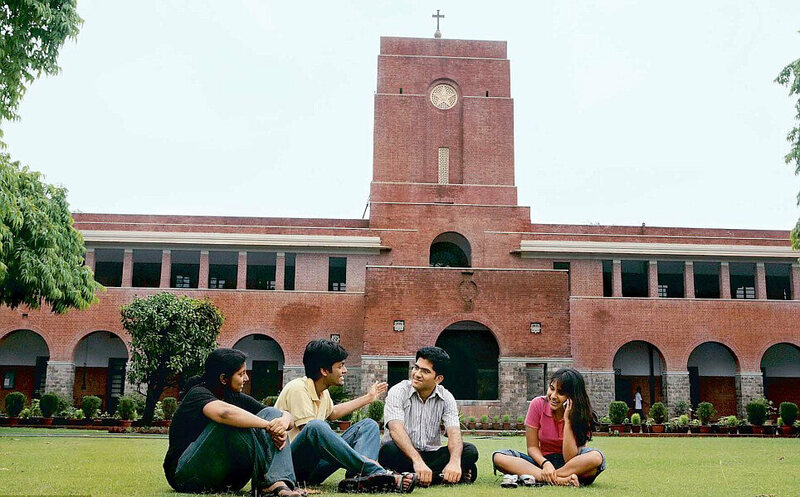 The DU Admission process followed by other colleges does not apply to St. Stephen’s. You can find their press release at the time of DU Admissions 2019 here. A very well known Delhi University College. Founded in 1899, the college is also among the oldest colleges in Delhi. Hindu College has a long list of Notable Alumni like the famous Director Imtiaz Ali and Ajay Jadeja. The college has a number of societies which are tasked with organising the department-specific co-curricular activities. Miranda House is a residential college for women in Delhi University. The college campus is one of the most beautiful and largest campuses in DU. Miranda House has a very active placement cell. The college also has International collaborations and exchange programmes for the students of different departments. D.A.V College Managing Committee founded Hansraj College. With a strength of over 5000 students, it is also one of the largest constituent colleges of the University of Delhi. The college has produced a long and notable list of alumni which are prominent leaders in their respective fields both nationally and internationally. Ramjas College is one of the founding colleges of University of Delhi, along with Hindu College and St. Stephen’s College. Ramjas College is a North Campus college. The college is famous for its sports teams and it has Tie-ups with premier foreign universities. Shri Ram College of Commerce, also known as SRCC is one of the institutions in India that does not require any introducion. SRCC is a very well known University of Delhi college, probably the most famous one. SRCC offers courses in Arts and Commerce Stream. The only Arts course offered by this top DU college is Economics. This is the most sought after college at the time when DU Cut offs are released. Indraprastha College for Women or IP College is the oldest college in Delhi University for women. The college offers Graduate & Post-graduate courses and is among the most prestigious colleges in India. Indraprastha College is the only DU college to offer Bachelor in Mass Media and Mass Communication [BMMMC] degree. Sri Venkateswara College is a co-ed constituent college of the University of Delhi, located in the South Campus. It is a very prominent college with a lush green campus spread over a very large area. The college has a hostel, but a large chunk of outstation students reside in Satya Niketan, South Extension and Lajpat Nagar. Jesus & Mary College also known as JMC is a women only college in the South Campus of DU. JMC is a minority college and has a 50% reservation for Catholic or other Christian students. The college is very well known for the quality of education that it provides and is a hub for co-curricular activities. Established in 1967, Gargi College is another women-only South Campus college in DU. Gargi offers courses in Arts and Humanities, Commerce, Science, and Education. The college is known for its academic excellence. The result of the last two years University examinations records 99% pass and about 45-50% first divisions in this college. Acharya Narendra Dev College established in 1991, is a very young college. It is the only college in Delhi University that is primarily for science. Acharya Narendra Dev College also offers part-time certificate and diploma courses in foreign languages such as French, German, Russian and Spanish. Established in 1990, Deen Dayal Upadhyay College is also known as DDUC. Apart from the regular courses, DDUC, located at Shivaji Marg, Moti Nagar (New Delhi) also offers Bachelor of Management Studies (BMS) and Bachelor of Business Studies (BBS). BBS is a unique course offered in only three colleges of the University for Delhi. There is no Delhi University Cut Off for BBS but follows a National Level entrance test in which over 25000 students apply every year. Sri Guru Tegh Bahadur Khalsa College or SGTB Khalsa College is a North Campus college. It is one of the oldest and most prestigious institutes for Commerce and Economics in India and regularly features in the top commerce college rankings with B.Com(Hons) and Eco(Hons) being the most sought after courses. The cut-offs of these courses last year stood at 97.5%. Bachelor with Honours in Commerce. Bachelor with Honours in Economics. Shaheed Bhagat Singh College (SBSC) is a co-educational institute located at Sheikh Sarai Phase II of Delhi University. The college fetched ranking of number 17 for the best Commerce colleges in India in 2012. SBSC is a part of the South Campus. The college is very well known for active and well functioning academic as well as extracurricular student-run societies. The colleges in the lists above are the dream colleges that every student eyes to get. However, according to us, the best college for you is the one that you get into! So, grab a seat as soon as the cut off lists are out, and you always have an option to migrate (take admission) in other colleges in next cutoffs. You can take admission in Delhi university. But u will not got admission in top colleges. I got 85.80% in our board exam in PCMB..I want to know if I can get admission in a good college under DU…by the way I am a ST candidate..
Sir…I’m from haryana…nd got 86 percent in PCM nd English…form CBSE board…how can i get admission in du college?? First you have to register yourself at du portal, which has been done last month. If you’ve registered then just Keep checking du colleges cutoffs. If the cutoff matches your preferred course just directly walk into the college along with your documents original and photocopies, on the same day and reserve your seat. Please tell me…how can i get admission in delhi university for bsc honors…???? You you have applied admission process by merit based there is chances of getting one of the top 10 college. Sir I have 84.2%in12th cbse am girl std want to get adm in du bsc can I? sir i got 90. 2% in 12th class cbse board i want to take admission in SRCC can i get or not?? ?? and want to study in physics hon. course suggest me college. Sir I got 91.75% in 12th class cbse board including top 4 sub I want to take admission in SRCC can I get or not ?? What is the procedure of admission in DU for b.com honours and what is the last date? Is registration is also require begor filling up of form? Form is released ,for registation in du…. Last date to filling form online by opening du official website is now extended to 22 june. First cut off will be declared at 30 june. After that you’ll got to know that if u can take admission in any college or not. Last date of admission is 17 August. Sir! I am from Haryana.I have 85% in 12th class. I belongs to backward class and I want to study in DU. May take admission a\c to you. Yeah! You can take admission. In which course you wanna enter? Sir,I got 85.75% in CBSE 12 .Can I get admission in DU ?,I belong from general caste . We both r find difficulties to take adms in good college of du !!! Yeah u can get adms!!! sir, I got 9.4 cgpa grad point from CBSE board class 10 I get admission in delhi university top collage 12 class ( science) so, please talk me- 8298880523, 9650336045 I belong BC-1 cast. So may i get good college in du ??? Sir I have scored 95%in PCB class 12 CBSE .Can I get admission in Miranda house or not?marks of English are included or not? I got 91% in CBSE board in PCM … So I got admission in DU.of college Ramjas college… For Bsc( physical sciences) course then I got admission in DU…#*****. Sir I got 75% marks in 12 from PCM . I am belog from OBC. Can I got any college for doing BA. Sir i got 97% in isc board from PCB. Can i get adm in psychology honours at LSR ? Kya sir B.Sc math me admission mil sakta hai.cotegery SC , 12th passed (PCM) reply me plz sir……. Sir I completed 12th from pcm side with 90% can I get admission in any good college in b.a. Sir I completed (2016) 12th from pcm side with 90% can I get admission in any good college in b.a. Sir, my optional subject in class 12th was entrepreneurship along with commerce . Can i get admission in b.com (hons). Can it be possible without having maths in class 12 we can opt for honours degree. Sir, i was not able to do the registration in university of delhi. Now i want to get admission in delhi university..
Now what can i do , so that i could get admission in any of the college.. Weather by management quota or any other mean..
Sir,kya letter entery se b.tech me cs branch me admission mila sakata hai kya.Category. OBC and female. Polytechnic final year chal ra hai.plzzzzz answer my question….. Please keep checking the updates with us regarding the cut offs and apply for the best college that suits you! Sir meri 12th result srf 80% he h to muje srf Delhi university ke deshbandhu or rajdhani college me he admission mil skta h to me college me admission le lu..ye college tikh h ya nhi. Or mere pass ambedker university ka bhai option h to konsi jyada better h Delhi university ke ye college ya ambedker university..? Sir, i got 92.7% in 12th (best 4 subjects) and then took a drop last year . Can i apply for admissions in bsc now.? Hello sir, my younger sister is completing her 12th this year. She is a SC candidate. What percentage of marks should be about to enough to take admission in DU.